After 30+ years of verbal harassment, I wanted you all to know that it has paid off and my parents have not smoked...much...for more than a month! I don't know from any personal experience how hard this is, but I gather from watching them struggle to kick the habit that it is just about the hardest thing a person can do. 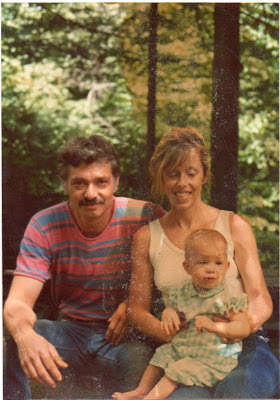 Hats off to Mom and Dad for sticking with it so they can continue to be their generous, fun, joyful, irreverent selves! I'm extremely proud of you guys and glad you haven't disowned me yet for nattering at you and nagging you about it all these years. Now I know they've slipped up a few times, but if I wait to write this post until they are completely smoke-free I may wait quite some time. Hopefully this post will help guilt trip them the rest of the way to kicking the habit entirely. Here is an old, adorable picture of my parents. I don't know who the baby is, but it's kind of an ugly baby so probably one of my brothers. Florian and I are going up to New York to visit them this weekend, and then on to Connecticut to see Florian's son Quentin compete in a dance competition. Always love going to see George and Doll. Especially now that I will not be talking to them through a cloud of smoke. Although strangely, even when my dad has been doing well, my visits seem to make him smoke more. Is it possible that I'm stressing him out? Have you ever tried to kick a really tough habit? What's your secret to success? I'm so happy to read that your parents are trying to quit smoking! I know how hard it is, but it's very rewarding, not only to them, but to their family. My dad passed away 4 months ago from lung cancer after being a smoker for 45 years. He was diagnosed and passed 4 short weeks later. He had many failed attempts at quitting, but I can't help but think if he succeeded one of those times, he might still be here. Good job and good luck to your parents! That is such a huge accomplishment! Congrats to them and have fun with your visit. I think when I see my parents, I make them stress a bit because they have no control anymore over my decisions! Congratulations to your parents, it is indeed a tough habit to quit! Your parents should be proud of themselves! Send along our congrats to your parents! Been there done that with the help of Zyban, going on 12 years now. Interesting thing - that was just before I got my first dog. Good luck to your parents. I can't imagine how hard it must be to give up such an addictive, long-term habit. My husband's mom was a heavy smoker. She quit many times. We learned to take comfort from the fact that the body starts recovering from the damage very quickly. And every respite was good for her body, even if it wasn't permanent. BTW, your mum looks like your doppelgänger! Or is it the other way around?